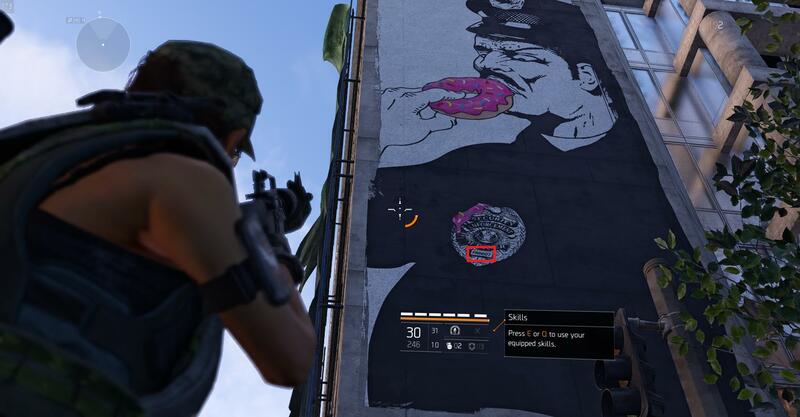 A homophobic slur on a piece of street art in The Division 2 was recently spotted, prompting Ubisoft to remove it, and apologise. The offending illustration was taken out in yesterday’s patch for The Division 2, though it was not listed in the patch notes. The art was spotted by an Imgur user who collected a few examples of misspelled words on signage and other in-world objects. The piece in question was among them, showing a police officer eating a doughnut. The art somewhat resembles the cover of Black Flag’s Police Story single, and the badge carries number “FA6607”, which is obviously leet speak for a well known homophobic slur. The same word appears on the single’s cover, so the connection is easy to see. But, since it’s one of many pieces adorning the sides of buildings in The Division 2, it may have been hard to spot, especially if you don’t know what to look for. “It’s been brought to our attention that a piece of street art in Tom Clancy’s The Division 2 contained offensive content. We removed the image from the game via a patch on Thursday, April 11,” Ubisoft said in a statement to PCGamer.